Screw Suppliers stand by their products. Our technical know-how, combined with many years of experience with fasteners ensures that we are able to provide our customers with accurate and practical information with regards to our products. 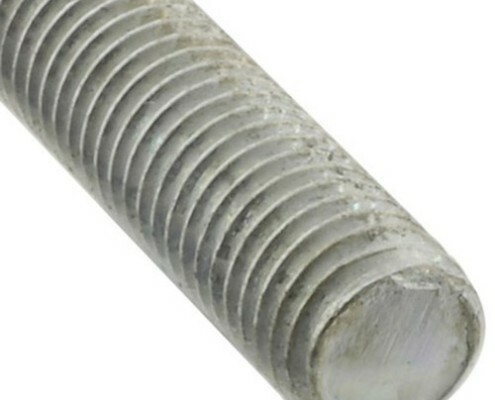 This extends to our threaded rod items, of which we supply various threaded rod sizes to suit a range of applications. Threaded rods, or stud bolts as they are otherwise known, are long rods that are threaded on both ends, depending on specification. These are intended for use in high tensile applications that require the stud bolts to have strength and durability. In construction, a threaded rod is used when a bolt of the appropriate size is not available to bond two materials together. For this reason, threaded rod sizes usually reach lengths far greater than any available bolt can. Due to a lack of bolts of sufficient length in certain applications, a threaded rod can be cut to the length needed. Then, it can bes pushed through the objects that are to be bonded together, then secured with nuts or other fasteners from both ends, thereby compressing the two items together. Joining metal and wood items together. They can be used for repair purposes. Often, they’re inserted into wood or concrete structures to stabilise them, allowing for much easier repairing. They are often used in the construction industry for various purposes. Stud bolts are also popular in the metalworking industry for building furniture and other consumer goods. When using these types of fasteners, it’s important to take note of what you intend to use them for. There are a couple of different types of threaded rods intended for use in different applications. When working with brittle materials, threaded rods with coarse threads are recommended. Reason being, they have thicker coatings and plating applied, allowing for better grip with a lower likelihood of damaging the material. Additionally, coarse threads also offer less chance of cross-threading. Harder, more durable materials are better suited to use with a fine coarse threaded rod. They are more suitable as these materials generally require fairly specific tensile requirements in their application, which fine coarse threading is able to provide. For both applications, threaded rod sizes are also important to note. While most suppliers provide threaded rods in 1m lengths, there is a whole host of different diameters available, making it important to know the correct size you need. Screw Distributors have many years of experience to their name. Our products, as well as our technical know-how, have contributed to the success we have experienced in our industry. We are able to properly advise customers on the proper usage of different fasteners, recommend the appropriate products, as well as supply them on time at your chosen address.